Buckley is a city in Pierce County, Washington, United States, founded in 1882. The population was 4,354 at the 2010 census and has grown to 4,550 people as of 2015 estimate. Buckley sits below Mount Rainier and is well known for hosting the annual Log Show. Buckley is located at 47°9′44″N 122°1′40″W﻿ / ﻿47.16222°N 122.02778°W﻿ / 47.16222; -122.02778 (47.162250, -122.027744) near the communities of Enumclaw, Bonney Lake, and Wilkeson. According to the Köppen Climate Classification system, Buckley has a warm-summer Mediterranean climate, abbreviated "Csb" on climate maps. Buckley is the home of Company A, 1st Battalion, 19th Special Forces Group (Airborne), a Special Forces National Guard unit. By 2013 city-data  recordings showed an overall population of 4,453 people, 51.4% of which being male as opposed to 48.6% female. The median age stood at 35.6 years compared to that of the state of Washington, which was 37.4. Of the reported 4,453 people, 91.8% were white alone, followed by 3.1% Hispanic, 2.9% of individuals of more than one race, 0.8% American Indian, 0.7% Asian, 0.5% Black, 0.1% Native Hawaiian or Pacific Islander, and 0.02% other race alone. Of the members of Buckley 25 years or older, 80.7% have completed a high school education or higher, while 14.8% have completed a minimum of a bachelor's degree. 4.4% have earned a graduate or professional degree, and the unemployed rate sat at 6.9%. Those who were 15 years or older, 47.4% were married, 36.3% never married, 2.4% separated, 1.7% widowed, and 12.2% divorced. The median household income also differed from the state's standing at $59,852, increased by over $10,00 since 2000, compared to Washington's $58,405. The median housing prices for overall units was $248,356, which detached houses were $263,853. Townhouses stood at $219,456, 2-unit structures at $181,905, 3 to 4-unit structures at $194,771, 5 or more-unit structures at $239,007 and finally mobile homes at a median price of $92,564. As of the census of 2010, there were 4,354 people, 1,591 households, and 1,049 families residing in the city. The population density was 1,125.1 inhabitants per square mile (434.4/km2). There were 1,669 housing units at an average density of 431.3 per square mile (166.5/km2). The racial makeup of the city was 93.0% White, 0.6% African American, 0.8% Native American, 0.8% Asian, 0.1% Pacific Islander, 1.2% from other races, and 3.4% from two or more races. Hispanic or Latino of any race were 3.1% of the population. By 2014, the city's population remained 93.0% White, and a combined 3.0% Hispanic or Latino. The median age in the city was 39.9 years. 22.5% of residents were under the age of 18; 8.9% were between the ages of 18 and 24; 25.4% were from 25 to 44; 30% were from 45 to 64; and 13% were 65 years of age or older. The gender makeup of the city was 50.3% male and 49.7% female. Males remained the dominant gender still in 2014 with a recorded total of 2,191 men and 2,163 women. As of the census of 2000, there were 4,145 people, 1,396 households, and 995 families residing in the city. The population density was 1,072.7 people per square mile (414.6/km²). There were 1,472 housing units at an average density of 380.9 per square mile (147.2/km²). The racial makeup of the city was 93.78% White, 0.63% African American, 1.13% Native American, 0.77% Asian, 0.17% Pacific Islander, 0.55% from other races, and 2.97% from two or more races. Hispanic or Latino of any race were 1.81% of the population. There were 1,396 households out of which 38.5% had children under the age of 18 living with them, 54.2% were married couples living together, 12.3% had a female householder with no husband present, and 28.7% were non-families. 22.1% of all households were made up of individuals and 7.2% had someone living alone who was 65 years of age or older. The average household size was 2.65 and the average family size was 3.12. In the city, the population was spread out with 26.4% under the age of 18, 7.4% from 18 to 24, 32.4% from 25 to 44, 24.8% from 45 to 64, and 9.0% who were 65 years of age or older. The median age was 36 years. For every 100 females, there were 102.3 males. For every 100 females age 18 and over, there were 106.9 males. The median income for a household in the city was $49,453, and the median income for a family was $54,900. Males had a median income of $43,409 versus $29,688 for females. The per capita income for the city was $19,744. About 3.6% of families and 8.3% of the population were below the poverty line, including 6.4% of those under age 18 and 4.9% of those age 65 or over. 1856 Decisive battle of Indian War fought at Connell's Prairie, 6 miles (10 km) west of Buckley. Jeremiah 'Jerry' Stilley, first permanent non-Indian resident, settled West of town. 1877 Railroad built from Tacoma to Wilkeson to transport coal. 1882 Town named "Perkin's Prairie"
1884 Northern Pacific built railroad spur track from Cascade Junction (between South Prairie and Buckley) to Perkin's Prairie. Town given name "White River Siding" by railroad men. 1885 Town's first store erected by "Dad" Chamberlain. Town renamed "Buckley" for J.M. Buckley, Northern Pacific Railway district superintendent. 1888 Town site platted by Alexander and Mary Wickersham. Town booming with lumber and shingle mills springing up overnight. District Court appointed five men as trustees of the Town of Buckley. First newspaper printed and published in Buckley - The Buckley Banner. Buckley Lodge 75, IOOF, chartered. Western Star Lodge, F&AM, chartered. 1891 Land donated for Buckley cemetery. May 5 Business District almost wiped out fire. Started on second story of the Buckley Lumber Store. June 17 New school built at present site of White River School District building on A Street. First organized water system established. 1897 Women's Musical & Literary Club founded. 1898 Business district razed by fire. First high school classes held, building erected. 1900 Mt. Rainier Chapter, OES, chartered. 1905 First high school graduation held. 1906 Buckley Aerie 1387, FOE, chartered. Gravity water system built; water stored in reservoir still in use by town. First general use of electricity. Town established fire department to replace Columbia Hose Company, a private fire-fighting group. 1910 New brick school built on A Street. 1912 Plank streets replaced by paving. 1914 Wickersham elementary school built. 1920 Large section of business district leveled by fire. 1923 Vocational unit added to high school building. 1927 FOE Auxiliary 1387 chartered. 1928 Buckley Kiwanis Club chartered. 1929 Town purchased pumper fire truck to replace hand-drawn equipment. 1931 Carbon Glacier Post 1414, VFW, chartered. 1932 Rainier State School opens. 1937 Buckley Garden Club organized. Work commenced on Mud Mountain Dam on White River. 1942 Mud Mountain Dam completed. 1944 Buckley railroad logging ended with closure of Buckley Logging Company mill. 1946 City limits extended to include Rainier School and farms south of town. Last company-operated coal mining discontinued. Additional construction at Rainier School. Buckley and Enumclaw school districts consolidated. 1950 Buckley Business & Professional Women's Club chartered. 1951 Rural Fire District No. 12 organized. White River School District (Buckley-Enumclaw) de-consolidated. 1955 Buckley Planning Commission created. New gymnasium built at high school. Ida Marge Orthopedic Guild chartered. Town established natural gas utility. Buckley Junior Chamber of Commerce chartered. 1958 New street signs erected. 1959 Northern Pacific railroad depot torn down. 2003 Elk Head Brewery opened its doors. 2003 White River High School moved to a new location in a brand new facility. 2012 White River football was played at Sheets Field for the first time since 2002. In the 1990 film Waiting for the Light downtown Buckley and locals had cameo appearances. In the 1996 comedy, Black Sheep, Al Donnelly (Tim Matheson) and Mike Donnelly (Chris Farley) were both from Buckley. The late 2000's movie Clawed was filmed all over Buckley and up the nearby logging mainline. ^ "Population Estimates". United States Census Bureau. Archived from the original on 2016-10-19. Retrieved July 9, 2016. ^ a b c d "City-Data Buckley, Washington". ^ a b "Suburban Stats". 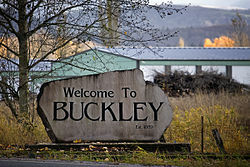 Wikimedia Commons has media related to Buckley, Washington.